Having spent most of my own childhood near farmlands, I can say with certainty that there is nothing quite like watching the autumn sun set beyond a golden cornfield. If you can catch the moment just right, even the air carries the twilight flecks of orange and yellow from the sinking sun, and the long shadows of corn stalks stretching across the ground seem to reach for your feet. Even without the pastoral sunset, late season cornfields evoke the essence of fall. Corn mazes can provide as much fun as your inner adventurer can handle, multi-color ears of corn provide a splash of color to any décor, and bundled corn shocks often decorate porches and store fronts. Yet whether summer or fall, what we know as corn today was certainly not quite what was originally found in nature. Most of us would probably not recognize corn’s wild cousin if we saw it, especially when we consider all of the variation in modern corn, so lend an ear and let’s explore! Corn first appeared in history somewhere between six and ten thousand years ago in central Mexico. Wild “corn,” though, is actually a grass called teosinte (Zea mays parviglumis). Over the last several thousand years, corn has been domesticated by humans through the process of “artificial selection.” If that phrase sounds similar to Charles Darwin’s mechanism behind evolution, “natural selection,” you are correct. Artificial selection is human-mediated selective breeding. Thousands of years ago, humans selected seeds from individual plants with the traits they most preferred—larger seeds, better taste, and so on, and they planted those seeds. Because offspring tend to look like their parents, the next generation of corn would be more likely to have the traits those early farmers preferred. That process of selective breeding continues today with broad agricultural types of corn—normal sugary, sugary enhancer, and supersweet-- and multiple varieties within each type. Just as in centuries gone by, farmers today can select for sugar content, starch content, height, speed of growth, and other such traits. Of all those variations in corn, one trait that folks often wonder about is how did all the colors of “indian corn” kernels arise, with even multiple colors on the same cob? That answer is a fascinating one! First of all, there are multiple genes involved in corn coloration, and varieties can be bred to either enhance or limit those colors. In the case of multiple colors, even on the same cob, each kernel of corn is an individual, genetically distinct embryo. Thus, each corn kernel can loosely be thought of as a “sibling” to the other kernels on the cob; in that case, it makes sense that each kernel would not necessarily be identical to its neighbors. On top of that, the outside of layer of the kernel—which displays color—has an extra copy of DNA due to a stage of reproduction common to flowering plants. That extra copy of DNA influences kernel color. Interestingly, in spite of thousands of years of separation and all of the agricultural selective breeding, teosinte and corn are closely related genetically. In fact, the two differ by only a limited number of gene regions. The wild grass can still be cross-bred with modern corn and produce “offspring” in the following generation. There’s so much complexity within a seemingly simple fall staple! The next time you head to a harvest festival, be sure to take a look at the dried ears of corn and think back on the wild teosinte grass and how far it has come. 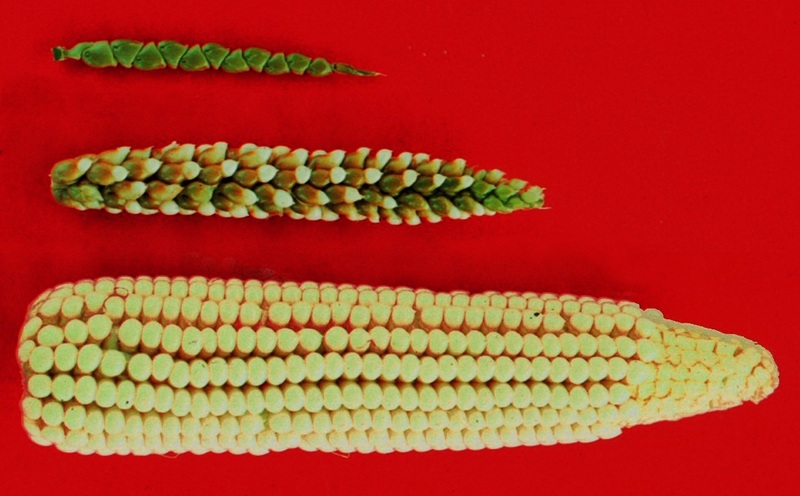 Top, original teosinte "cob," transitional maize, and maize (corn). Connecting to the Outdoors Tip: There are a number of local farms in the just outside of Pittsburgh that are full of fall spirit, complete with corn mazes and dried corn all around. Be sure to visit one of them and enjoy the fall weather! Continue the Conversation: Share your nature discoveries with our community by posting to Twitter and Instagram with hashtag #bioPGH, and R.S.V.P. to attend our next Biophilia: Pittsburgh meeting. I never thought of each corn kernel being a sibling to one another like that. Interesting stuff!